We reported way back in September about a program called MySpace MP3 Gopher that lets you download music from MySpace even if the download option is disabled. As we predicted, the author has kept the program up to date with the latest version released May 27, 2007. 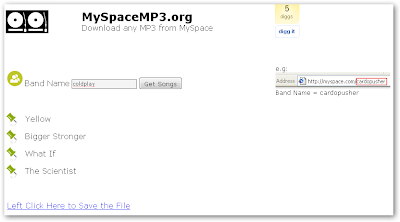 But there's an even easier way to download music tracks off of MySpace. No software download necessary. Just use MySpaceMP3.org. Enter the band name of the MySpace profile that you want to download music from. You'll find it in the URL after "myspace.com/". Then click Get Song, and a list of the available songs will appear. Click on the pin icon next the track name, and you should see a download link pop up in a few seconds. However, the site doesn't work perfectly. You might see an error pop up when trying to download music, especially from if it's from one of the more popular bands on MySpace.